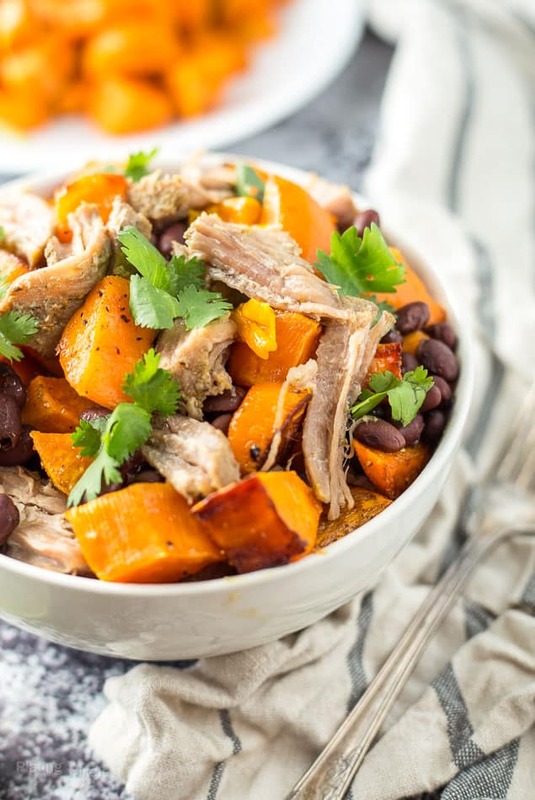 Hearty and healthy fall Slow Cooker Sweet Potato Carnitas Bowls. Less than 30 minutes of prep for an easy gluten-free weeknight meal. Caramelized sweet potatoes with marinated pork carnitas, black beans, bell peppers and onion. This shop has been compensated by Collective Bias, Inc. and its advertiser to create this Slow Cooker Sweet Potato Carnitas Bowls recipe. All opinions are mine alone. 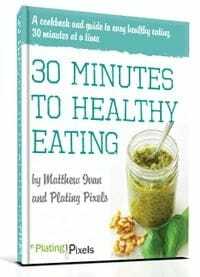 Only have 30 minutes to prep a dinner, but want to serve a quality, wholesome meal to your family? I got you covered with these Slow Cooker Sweet Potato Carnitas Bowls. Besides seasonal fruits and baking, slow cooking is one of my favorite parts of fall cooking. Technically you can slow cook year-round, but I find myself using it a whole lot more in the winter months. What’s better than adding a few ingredients to the slow cooker in the morning, going about your day, and coming come to a ready-made meal with the lovely scent of comforting food? That’s my kind of welcome home. If you forget to prep in the morning you could also cook on high in about two hours. This carnitas bowl recipe is super easy thanks to the slow cooker. I chose to roast the sweet potato ahead of time and add in after the pork carnitas was cooked to give it that sweet caramelized flavor. To save even more time, simply add it in the beginning to cook with the pork. Some onion and bell pepper in the slow cook infuse more flavors throughout the dish. 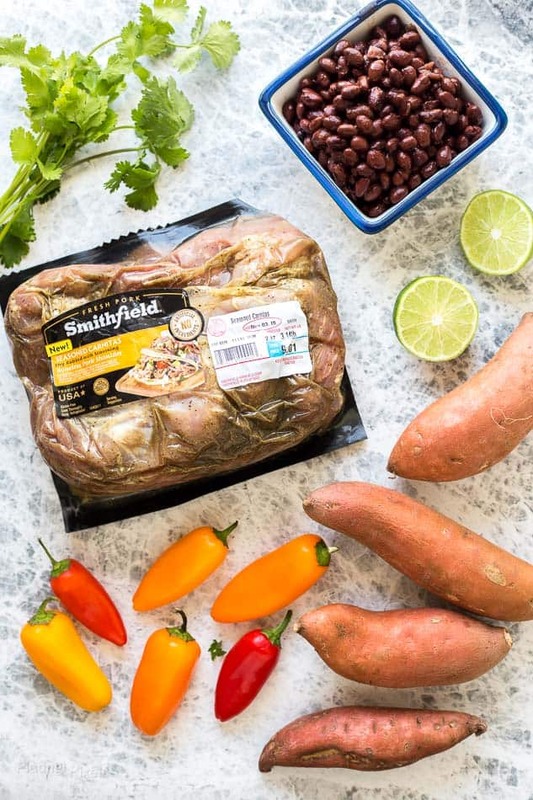 To go along with the easy prep theme, use Smithfield Marinated Fresh Pork: Boneless Pork Shoulder Carnitas. It saves you time with pre-seasoned flavor, while providing quality pork you can feel good about; 100% pork with natural ingredients. It’s one of four pre-seasoned pork varieties that are a perfect choice for easy weeknight meals. They’re not just for slow cooking either, try them grilled, roasted or sautéed. It truly is set and forget, full of flavor and makes plenty of leftovers. You could even repurpose it into a breakfast scramble or easy lunch burritos. 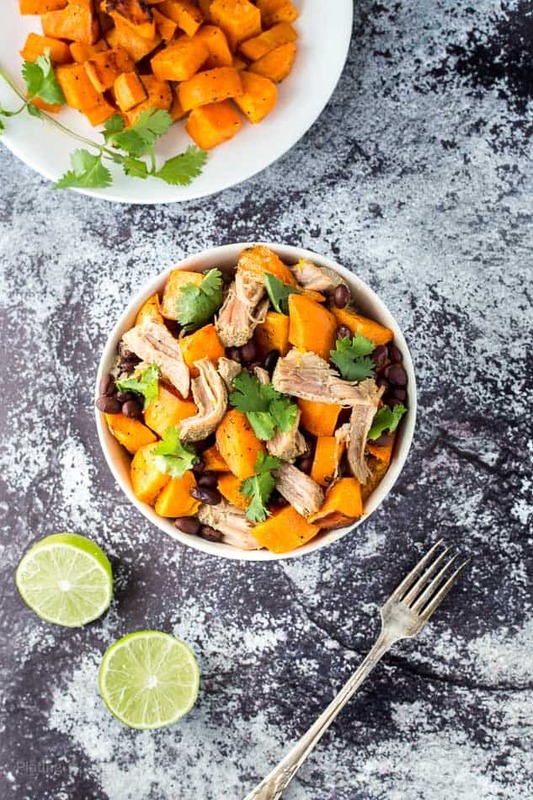 The next time you have a busy day and want an easy meal, try these Slow Cooker Sweet Potato Carnitas Bowls. Less than 30 minutes of prep for an easy gluten-free weeknight meal. 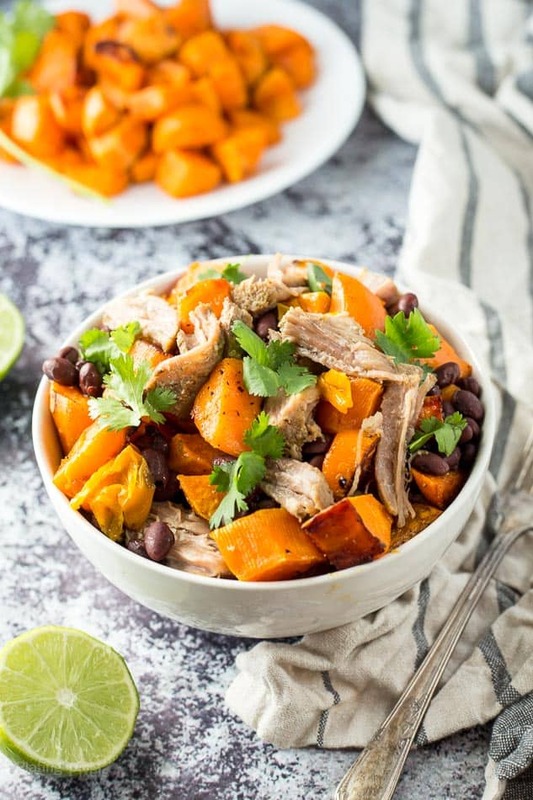 Caramelized sweet potatoes with marinated pork carnitas, black beans, bell peppers and onion. 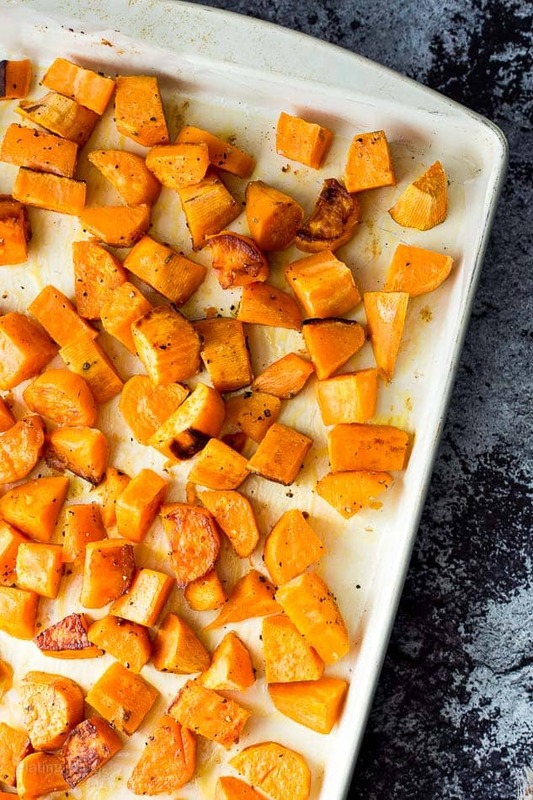 Optional: Preheat oven to 425 F. Place sweet potatoes on a foil lined baking sheet in a single layer, drizzle with olive oil, then sprinkle with salt and pepper. Roast 12-15 minutes, or until soft and lightly browned. Remove from heat, cool then chill in fridge. You’ll be adding to slow cooker at end. Stir together pork, vegetable stock, onion and bell pepper in slow cooker. Cook covered on low heat for 8 hours or high for 2-3 hours. Once cooked and tender, use forks to pull apart pork into carnitas. Some liquid is ok, but drain extra if needed. Carefully stir in roasted sweet potatoes and black beans. Cook a bit longer if needed to heat through. Serve in bowls with cilantro as garnish. To save time you can skip first step and add raw sweet potatoes into pot when slow cooking carnitas. However you won't get benefit of roasted, caramelized flavor. I love using the slow cooker when the weather gets cold too. And I love all the flavors and fall colors you put together for this dish. Definitely a great weeknight meal! Thanks so much Annemarie! Hope you enjoy this warm and cozy dish. These bowls look amazing, Matt. Perfect weeknight dinner. Saving recipe for later! They totally are. Thanks Igor! Great use for my slow cooker, great dinner for our table. Thanks. Carnitas are so easy in a slow cooker, thanks! Yes to the slow cooker and yes to carnitas bowls! This is something everyone in my house loves! I can’t wait to try your recipe next time, looks absolutely delicious! Haha thanks Kristine! Slow cooking truly is a wonderful thing! I LOVE slow cooker recipes! This is great- I need to get my slow cooker out again! I totally agree. Hope you do and thanks Sarah! 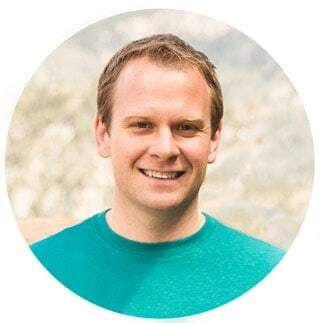 Thanks so much David! Slow cooking is awesome and hope you get to try it soon.